By now you are probably tired of me referring to my fiancee. Well, be tired no more, because she will soon be referred to as wife. 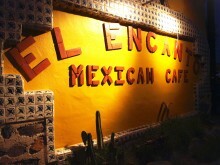 In fact, one step in that process was a visit to El Encanto in Cave Creek, Arizona. You see, El Encanto has been chosen as the location of our rehearsal dinner. But before that dinner could happen, we decided to take the place for a spin to see what the rehearsal would taste like. Pretty much since I first started visiting my fiancee’s parents in Carefree, I’ve had Brisam’s and their supposedly amazing burger pointed out to me on nearly every trip through Cave Creek. 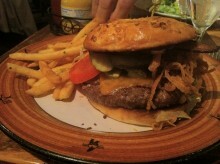 Finally, I had enough and demanded we go so I could check out the burger for myself. Brisam’s is essentially a sports bar and things probably get pretty crowded at night, but we ended up going for lunch and got a quick seat and a quick look at the menu. While their signature Brisam’s Burger probably attracts the most eaters, I couldn’t get into it due to the pile of mushrooms it claimed to have. 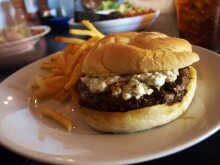 Instead, I opted for the Blackened Burger, which had some Cajun-style spices and was topped with blue cheese. It came with lettuce, tomato and onion on the side to add to the burger, but I told the waitress that they didn’t need to waste those veggies on me. On the side I had a choice of a couple salads, cole slaw and fries and went with the obvious choice of salad. Err…I mean fries. What’s that you say, Kemo Sabe? One benefit of getting married is the tastings. Not so much tasting food that the guests will eat, but traveling back and forth between Arizona and LA to plan things, and knowing there will be food in need of eating. On my most recent foray into the Grand Canyon state, we went out to dinner at a place called Tonto Bar & Grill in Cave Creek. Tonto is quite the popular place, with an outdoor patio looking out onto a golf course and an old Western eclectic interior. The menu ranges from some fancy salads to super fancy steaks, but somewhere in the middle there is burgers. And having gone at least a couple days without crushing a burger, I felt it was time. Remember playing Cowboys and Indians as a kid? Thankfully, there is a place in the world where that fantasyland still exists. It’s called Arizona, and while not everyone runs around with a gun or bow and arrow, there are places you could picture saddling up a horse just as easily as stopping by in a hybrid. 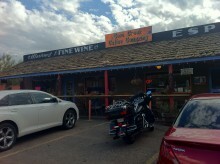 One such place is the Cave Creek Coffee Company, affectionately known as C4 by locals. The facade is reminiscent of Tombstone, but the interior is pure class (not that Tombstone was lacking in class…). Stop being such a putrid chicken. For a little lunch pickup in Cave Creek, Arizona, just north of Scottsdale, I was told we would be ordering from a local sandwich shop called Bad Donkey (not to be confused with Bikkuri Donkey). Although actual donkey was no where to be found on the menu, it seemed they had come up with some very creative names to make up for the lack of donkey. 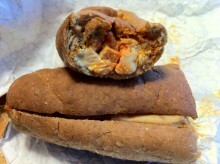 Their veggie sub was called Grass on a Roll and their Reuben was creatively called Reuben Worth Choosen (yes, choosen and not choosin’).